The development of the global open access movement has seen a sharp rise in the number of journal articles made freely available either through institutional repositories (green OA) or directly from publishers (gold OA). And evidence shows that this content is indeed being accessed – IRUS (Institutional Repository Usage Statistics) has recorded over 130 million downloads from UK institutional repositories since 2012, with our own LSE Research Online registering more than 2 million full-text downloads in 2017 alone. We’re also increasingly able to see how this content is being used – by researchers and others beyond the academy – through tools like the Request a copy button, Harvard’s “Your Story Matters”, and the Open Access Button. As open access publishing becomes the norm for many researchers, we can start to think about accessibility and how well this scholarship is communicated to the general public. This article by Lucy Lambe originally appeared on the LSE Impact of Social Sciences blog as “Don’t let publication be the end of the story – transforming research into an illustrated abstract” and is reposted under the Creative Commons license (CC BY 3.0). At the LSE Library we have recently experimented with transforming open access articles into cartoon abstracts. The Creative Commons (CC BY) license, required by many funders when publishing open access, not only means that articles can be freely accessed and shared by anyone but also that those articles can be transformed and built upon, used to create something new and original. Our project involved commissioning illustrated abstracts to promote the School’s RCUK block grant and open access fund for OA journals. Two articles were chosen for this project, both of which the library has funded for open access publication during the last 12 months. The first, by Alpa Shah, focuses on the core of ethnographic research, participant observation; the second, by Steve Gibbons, Olmo Silva, and Felix Weinhardt, examines the effect of neighbourhood transience on teenage performance in school. The library’s next involvement was to connect the authors of these articles with a yet-to-be-commissioned graphic artist. 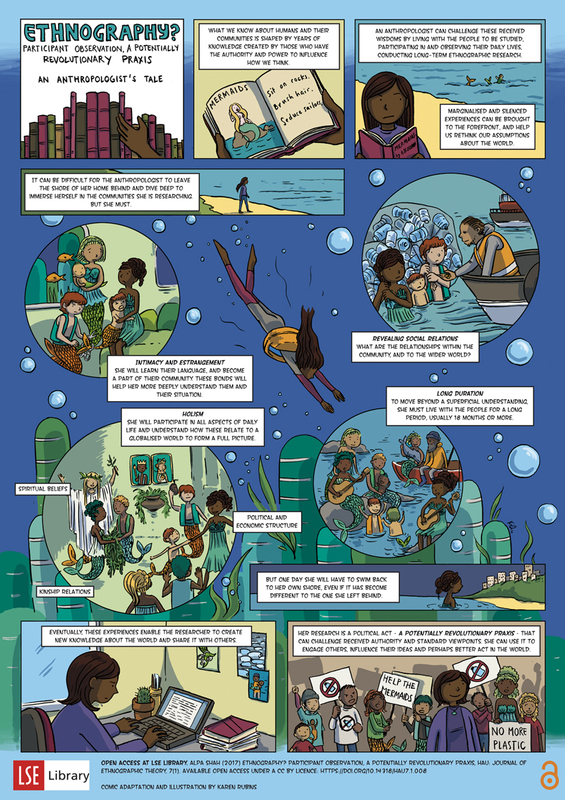 My experience as a librarian had provided little in the way of commissioning artists, so this was a little daunting, but fortunately I soon came across the work of comics creator and illustrator Karen Rubinsand found her portfolio matched our requirements. After hearing about the project, Karen agreed to take part and was ready and willing to tackle the challenges of working with academics to translate their research into a comic strip. The creative process took some time and involved many conversations between Karen and the authors. Without a background in either topic, Karen had to work closely with the authors to ensure the results and message of the research were properly and fully understood before translating them into comic strip-style illustrations. Alpa compared the process to translating research into a different language – as a writer you want to ensure your research and ideas are being correctly represented, working closely with the author or artist. The authors of the second paper enjoyed seeing the transformation from academic text to illustration, with Olmo describing seeing Karen begin to understand the message of the paper and light up with ideas about how it could be represented visually. As the artist, Karen described the process as challenging but rewarding and a great opportunity to try something new. The completed illustrations can be found below. Once the illustrations were complete, we took steps to ensure they could be seen and disseminated widely, printing the images onto posters and banners. We wanted to demonstrate how publishing open access under a Creative Commons license allows you to do more with your work, without requiring permission from a publisher. The banners have been on display at a number of points around campus, where they can be seen by academics, students, and staff, and the cartoons have also been shared widely on social media by the authors, their departments, and colleagues. One of Alpa’s tweets sharing the illustrated abstract received over 140 retweets, and both illustrations received overwhelmingly positive comments from people online. By turning research into an illustrated abstract it’s possible to make academic work more accessible to a non-technical audience and people outside of the discipline. Alpa and Karen have even been approached by an author who would like to include the image in a forthcoming anthropology textbook, while Alpa hopes the article will also reach students, other academics and even non-academics, to explain the value of anthropology and long-term participant observation. This method of communicating research may not be suitable for all topics, and a different combination of artist and researcher could have different or less effective results. The article on ethnography worked particularly well as the author had already resolved to write in a manner accessible to a more general audience. 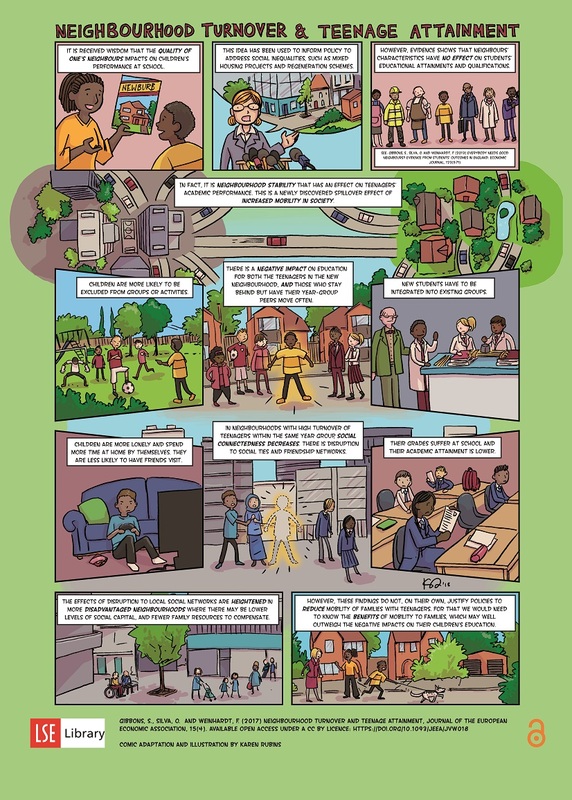 However, the article on neighbourhood change was quite technical and described a concept unfamiliar to most outside the discipline, yet was still able to be reimagined visually and with a clear narrative for readers to follow. Karen strongly believes in the power of comic strips to present complex concepts – they help the reader digest the idea in a quicker and more instinctive way than reading text alone, and they’re fun! 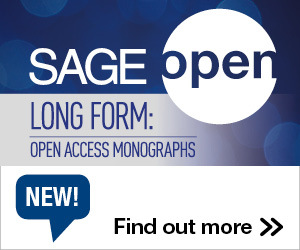 For any libraries or institutions thinking about doing something similar to promote their open access publications, make sure the content has the right license to do so, include the authors early on so they engage with the process, and think carefully about how to share and promote the images within the university and beyond. Don’t let publication be the end of the story! This entry was posted in Communication, Interdisciplinarity, Research, Tips and tagged LSE, Open Access. Bookmark the permalink. Trackbacks are closed, but you can post a comment.